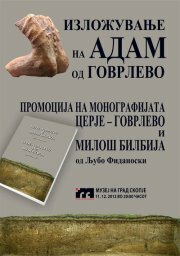 On December 11, 2012, starting at 8:00 pm, the Skopje City Museum will host two events associated with the Neolithic site Govrlevo near Skopje. The permanent archaeological exhibit of the Skopje city museum will be augmented by the addition of “Adam of Govrlevo” – a Neolithic figurine, consisting of a male ceramic torso, discovered in the year 2000. In addition, the Museum will present the monograph “Cerje-Govrlevo, Milos Bilbija”, dedicated to the archaeologist who discovered and evaluated the site of Govrlevo, as well as to the history of archaeological research on the site and to some of the findings, a part of which remain unpublished. In order to mark this event, we publish a text by Vasilka Dimitrovska, co-founder of Haemus, which has been printed several times in Macedonian magazines. At the beginning there was the Earth. And it turned into clay. 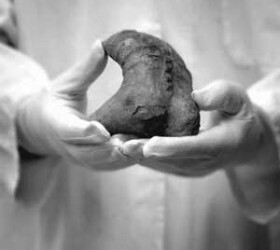 Then it shaped into a figurine, the hands which created it – divined it, and gave it a name – Adam. A small ceramic figurine of a male torso, in a seated position, has been creating a real turmoil in the scientific community since a couple of years ago. This figurine was excavated at the turn of the millennium, from the archaeological site of Govrlevo (Skopje, Macedonia). 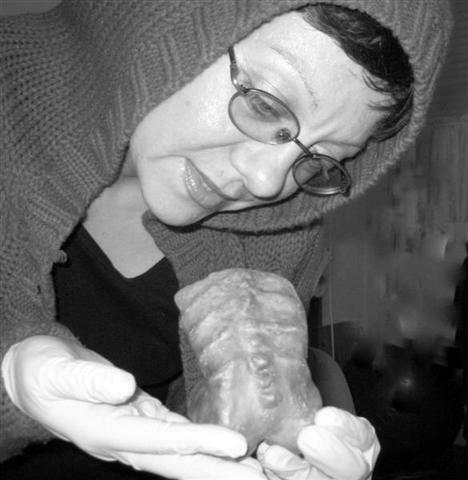 This figurine is dated to be some 6000 years old, and represents one of the most unique archaeological finds in the world. It has received the epithet of a millennial find. According to Milos Bilbija, the archeologist who excavated this miraculous figurine: “the maker’s inventiveness is strongly suggestive to the extent that the modern observer can easily recognize a 6000-year-old message in it”. At times it reminds of the famous sculpture by Rodin – The Thinker; however, Adam of Macedonia offers an unusually artistic craft in shaping this male torso in a seated position, with an accentuated anatomy, deeply redrawn belly, as if the figurine was trying to point at some kind of a diaphragmatic breathing, and there is even a broken phallus. When you take a look at this figurine, you simply cannot remain indifferent to its contextual message. The incompletely preserved expression of a human male, caught in the moment of either diaphragmatic breathing is one of the most important foundation practices for meditation. When the diaphragm muscle contracts, it pulls the bottom of the lungs downward, causing them to fill, while the ribs flare outward to the sides. The chest and abdominal muscles are not used in diaphragmatic breathing. Conscious diaphragmatic breathing is extremely relaxing to the autonomic nervous system and is essential preparation for deep meditation. Is it possible that at the time when the Great Mother’s cult was in full bloom in Macedonia, a unique and admirable object of such importance for our understanding of spirituality can be produced by the hands of those who apparently have marked the most curious epoch of human existence, that of the matriarchate. This in itself is a very untypical discovery for the period, since it is strange to see that the Great Mother Goddess, who could hear all the prayers of the people and could provide soothing to their troubles, would allow a precise depiction of the male spirituality to appear in the figurine of Adam, thus juxtaposing the representative elements of the culture as a whole. Could it be that there was a balance of sexes in Macedonia, way before one of them claimed dominance over the other? At only a hand-distance from civilization, on the other side of the Vodno peak, down the silent slopes from behind Skopje, where only the symbols speak their taciturn tales, Adam of Govrlevo is trying to communicate a message, as old as time itself. In the history of Arts almost all figurines from prehistory are symbolic in nature and convey a kind of philosophical viewpoint of the culture that produced them. 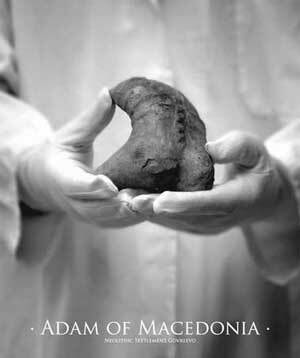 Adam of Macedonia was created in an epoch where the words, as we know them, would have no meaning. Everyone would agree that the explanation for Adam’s existence is at hand; however, his enigma still remains intangible to many. For the time being, we have several conflicted viewpoints of professionals in the field of archeology. If we assume that with the accentuation of the anatomy, the prehistoric inhabitants of Macedonia would leave a more significant message through Time, then we may need to reconsider the spiritual dimension of human existence. Have you ever tried to make a human-like figurine, which would depict your complete viewpoint and your personal experience of the world as such? You would probably notice that you need a lot of love, care and attention, as well as skills to perform such a miracle. This finding is of priceless value, and has already been registered as a monumental masterpiece with an explicitly realistic art form, and can be seen at the Museum of the City of Skopje.